This building was originally known as Buckley's pharmacy. It was constructed in 1935, by Harry Joyce. The individual who invented Buckley's cough syrup was a relative of the Buckley that opened up the original pharmacy in Wells30. 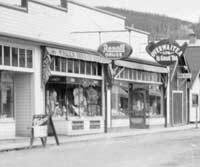 Local legend has it that the family made a small fortune in Barkerville and went on to open up this business, in Wells. In the 70's it was the Thrifty Hardware Store and then went on to become Sui Mings Oriental Gift Shop, before becoming Buckley's Pub, which closed down in 1999. It was recently purchased by the District of Wells and has become their municipal offices. There was another pharmacy in town called Rexall's Drugs located across from Buckley's.